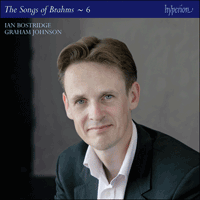 Ian Bostridge brings his characterful lyricism, and singing of beautiful intelligence, to a welcome sixth volume in Graham Johnson’s comprehensive series. This is the sixth volume of a series that presents the entire piano-accompanied songs and vocal works of Johannes Brahms. 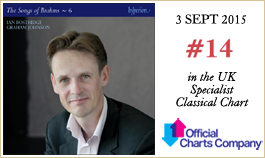 As such it is a companion to the series undertaken by Hyperion for the songs of Schubert, Schumann, Fauré, Strauss and Liszt—in addition to such composers as Chausson, Chabrier and Poulenc whose complete songs have been issued in boxed sets. Brahms issued the majority of his songs in groups collected by opus number. There is a tendency in modern scholarship to suggest that he envisaged performances of his songs in these original opus number groupings. Of course one cannot deny that some planning (though of a rather variable kind) went into the arrangement of these song bouquets for publication, but good order and cohesion in printed form (as in an anthology where poems are arranged to be discovered by the reader in a certain sequence), though pleasing to the intellect, do not automatically transfer to the world of the recital platform where one encounters a host of different practical problems, casting (male or female singer) and key-sequences (high or low voice) among them. Printed poetry collections are as lovingly assembled as an opus of a composer’s varied settings, but this does not mean the poems therein are designed to be read aloud from cover to cover: the compiler of these volumes, whether or not the poet himself, would expect items to be selected by the reader according to taste or need. The anthology (or indeed opus number) might be likened to a well-ordered jewel case from which precious items may be extracted for use, depending on the occasion: the wearing in public of every item therein on a single occasion would be both impractical and vulgar. There is little evidence, especially from concert practice of the time (where items from the Schubert and Schumann cycles were often ruthlessly excerpted), that Brahms’s publications were conceived within a spirit of cyclic unity that called for an integral performance of the entire group. Each volume of this Hyperion edition takes a journey through the career of Johannes Brahms. The songs are not quite presented in chronological order (Brahms had a way of including earlier songs in later opus numbers) but they do appear more or less in the order that the songs were presented to the world. Each recital represents a different journey through the repertoire (and thus through Brahms’s’ life). In a number of these Hyperion recitals an opus number will be presented in its entirety. In the case of this volume it is the songs of Op 32 and Op 96, from opposite ends of the composer’s career. And it is not always opus numbers that gather together the most interesting musical conjunctions: this recording presents all six of Brahms’s Heine settings: these were published as parts of Opp 71, 85 and 96. Far from dreaming of complete evenings of his songs in public performance, Brahms preferred to hear no more than three of his own songs in any one concert. This astonishing information comes from an invaluable book of essays—K Hamilton & N Loges, eds. : Brahms in the Home and the Concert Hall: Between Private and Public Performance (Cambridge: CUP, 2014). The conventions of music in the home, where so many songs were first heard and discussed in an environment of lively and cultivated enthusiasm, did not include listeners buckling down in respectful silence to a substantial sequence of songs, as if they were at a public concert. Brahms seems to have been happiest hearing his songs as Hausmusik and surrounded by supportive informality—and I daresay Schubert would have said the same about the Schubertiads. The present-day enthusiasm for hidden, implicit, unknown or concealed connections between songs seeks to feed the appetite for a cycle-hungry recital format favoured in the twenty-first century, but almost unknown in the nineteenth.